A trip to Vietnam will definitely inspire your inner chef. 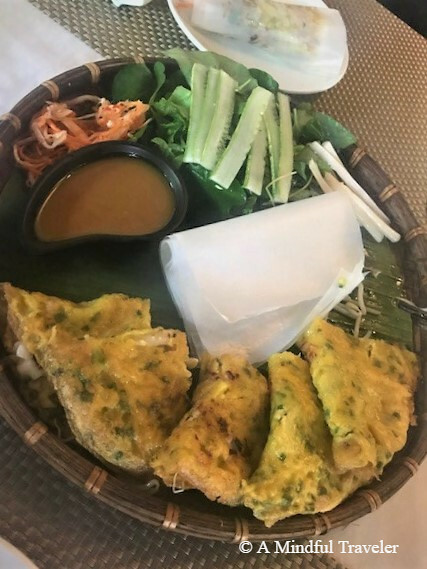 While in Da Nang, Vietnam, Bánh Xèo (which means “sizzling cake”) was a popular dish found not only in restaurants but local street stalls as well. 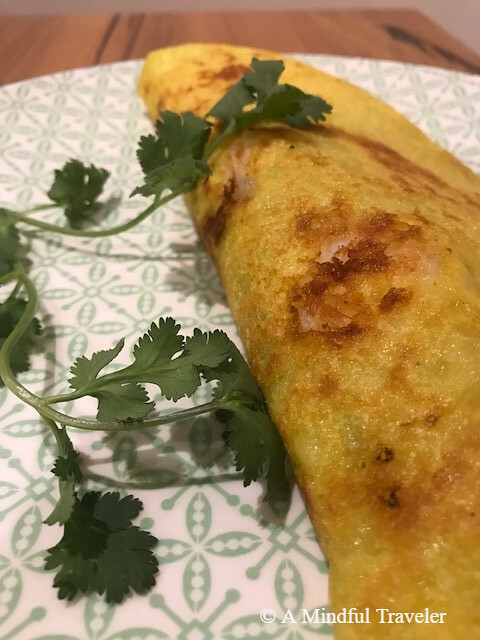 Here’s my version of this delicious crispy Vietnamese savory pancake. 24 cooked prawns, cleaned, peeled and butterflied in half. Alternatively, you can pan fry 24 green/raw prawns and keep aside. Combine all batter ingredients in a bowl. Stir until a smooth batter forms. Cover and set aside to rest for 1 hour. To make the dipping sauce, combine all the dipping sauce ingredients into a small bowl, stir to dissolve sugar and set aside. Heat a non-stick frying pan over medium-high heat. Brush with vegetable oil then add ½ cup batter, swirling pan to form a thin pancake. 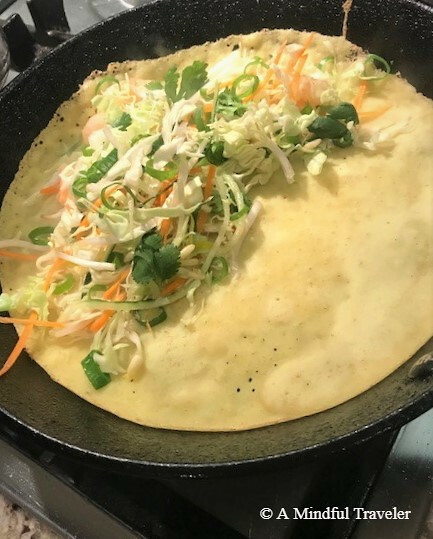 Top half of one side of the pancake with one-eighth of the sprouts, carrots, cabbage, spring onions, herbs and 3 prawns. Once the pancake becomes golden, flip pancake in half to cover filling and cook for a further minute to warm through, then remove once the pancake is cooked and crispy with a spatula and place on a serving plate. Repeat with remaining batter and filling ingredients. Cut and serve rolled in the lettuce leaves and with the chili dipping sauce. These look and sound delicious. Love all the zingy flavours. Mmmm these sounds and look absolutely delicious! Thanks for sharing a great recipe, it sounds easy to make! I love the flavours of Vietnamese cuisine too. So fresh. Seafood all the way! Always fun to experiment in the kitchen. This is a super cool alternative, thanks for sharing this recipe! It’s a great snack or dinner too. Yummm stealing this recipe for sure! These look like a cross between a crepe and a spring roll! Delicious!! I must try them. 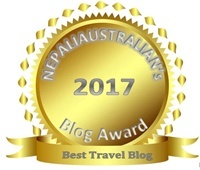 Your Vietnamese experience has left you with more than sightseeing memories. Oh yummo L, that’s been filed away for future enjoyment. Your pork balls of a few weeks back were excellent. That’s an unique dish and really interesting! Oh Lorelle! I am so excited to see this post. 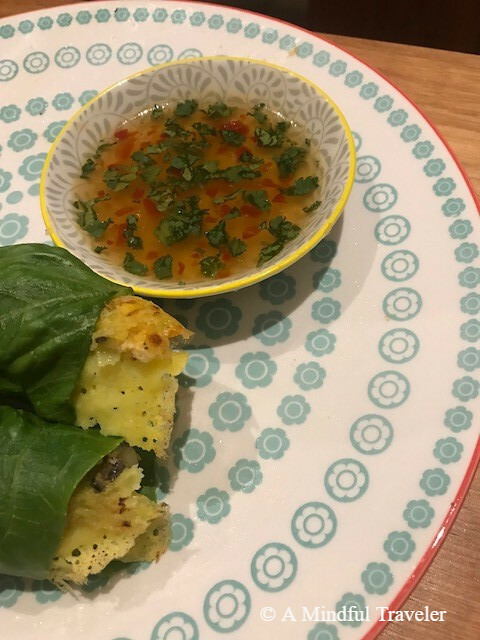 Banh Xeo is my absolute favourite thing to eat in Vietnam, but we can’t get it at our Vietnamese restaurants in Singapore. Now, I can make it using with your recipe!!!! Wow, how unfortunate not being able to find such a delicious dish in Singapore. Learning about seafood has always been a kind of adventure..there are so much food to eat,places to explore elevate one’s mind.